An emerging energy storage player just received a very big chunk of capital. In March, Green Charge and TIP Capital announced a $10 million fund, part of TIP Capital’s broader offering of fixed-rate monthly financing payments for lighting retrofits and HVAC upgrades. Green Charge has also tapped $12 million in stimulus grants, as well an undisclosed amount of funding from investors including ChargePoint founder Richard Lowenthal. Can power-purchase agreements (PPAs) and power efficiency agreements (PEAs) spur the energy storage market to grow as fast as the residential solar industry has expanded? 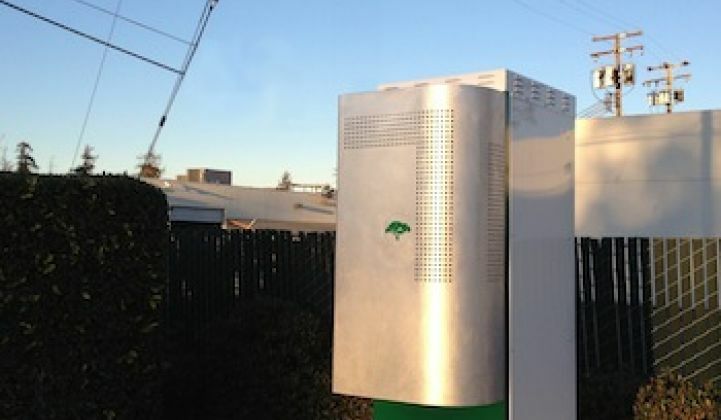 Founded in 2009, Green Charge’s GreenStation has been installed by 7-Eleven, Walgreens, Levi's Stadium, UPS, school campuses, and cities across California, including Redwood City and Lancaster. Green Charge owns and operates the energy storage assets deployed at customer sites, with zero capital or maintenance costs for the customers. The company claims that it is already profitable and has more than 25 customers. As with a solar PPA, the power efficiency agreement shifts the performance burden and technology risk onto Green Charge as the asset owner. The $56 million includes some working capital, but most of the funding is intended to finance storage systems. The funding source, K Road DG, is launching a new distributed generation and smart grid business and operations platform "based on the conviction that renewable and distributive power generation will ultimately power much of the globe," according to a release. K Road DG includes executives William Kriegel, Gerrit Nicholas, Mark Friedland and Intel Capital founder George Coelho. Although the company calls its program a "PPA," the fact is that it's a shared savings model that more closely resembles an ESCO arrangement. The company's innovation is the software that operates the battery and electronics and models customer usage in the context of utility rate structures. What’s really driving the first wave of building battery systems are demand charges -- the portions of utility bills that building owners pay when their total electricity consumption hits or exceeds certain thresholds at any moment in time. Because these “peaks” are hard to monitor or predict, they’re hard to prevent -- and in certain markets, like California or New York, they can add up to a significant portion of overall utility bills. We spoke with Stephen Kelley, Senior VP at Green Charge. He called the power efficiency agreements "a true PPA instrument for energy storage" and gave the following example. A California state college saved $120,000 in demand charges alone in the first year of using the Green Charge system. Under the shared-savings model, the college keeps 25 percent of that $120,000. Kelley told GTM that Green Charge systems range in size from 30 kilowatt-hours to 300 kilowatt-hours and have three years of performance data behind them. The batteries are lithium-ion and are sourced from Samsung, which provides a ten-year warranty. He said that the software has been "refined and proven" over the last 2 1/2 years, adding that Green Charge has a market presence advantage of more than a year over its competitors. Combined with the new financing arrangement, Kelley said it "will allow us to leapfrog our competition." That competition would be Stem, SolarCity/Tesla, Sonnenbatterie, Greensmith, and others in the space. Kelley notes that he has "never seen Greensmith" involved in a competitive deal. He notes that Green Charge has a massive backlog of business and deep experience in interconnecting energy storage systems with major utilities across the nation, including California's investor-owned utilities.